This chapter is about nonviable antigravity devices, and is the work of the U.S. Government. The first of many archetypes is the oscillation thruster (see Figures 1 and 2 below). It is a device that uses internal mass movement to create net thrust. Such a device moves forward because the forward speed of the internal masses travels faster in one direction than the other. This would seem to be a breakthrough (no propellant), but these devices require connection to the ground (hence propellant) to function. If left to dwell in space, or to be used for upward motion, nothing special will happen (the device won’t work). The device will move in jolts, as the friction of the ground will eventually overcome the vehicle (masses eventually stop moving forward faster). Then the process starts anew. A simple test to disprove such a device is the pendulum test. Simply put, a pendulum is over the device and turns the device on. The pendulum should oscillate rather than stay pushed out. If there is oscillation, then no net thrust is produced (as the pendulum would just oscillate like the device and not counteract gravity by staying in an unfavorable gravitational position). It is important to have the device and power supply focused on the pendulum and for the pendulum to be tall. The reasons are to avoid power cable annoyances and to reduce natural oscillation frequency to be less than the device (it also makes the lateral force more pronounced). It must be a level pendulum so as not to yield false impressions due to the titling base of a simple pendulum. For the same reason, an air track in not recommended. An air track would also create an initial velocity that needs to be accounted for. The “jerk” effect has been shown to baseless in claim. It is important to have an open mind though. 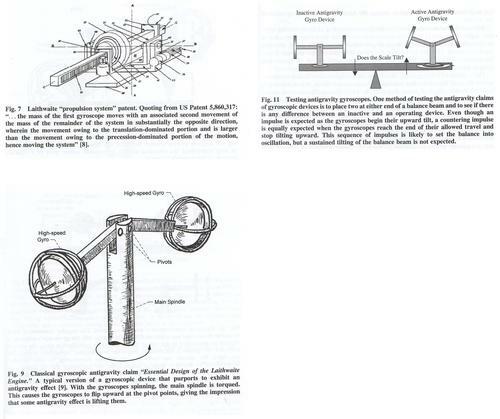 The next device is the gyroscopic antigravity device (see Figure 9 below). Examples such as Eric Laithwaite’s in 1973 do not demonstrate antigravity. Devices like his lift are based on a change in the axis of the gyros. They are completely dependent on an external gravitational field and their own torques. A typical machine consists of gyros, a main spindle, and pivots. In order to test such a device, it is necessary to measure the weights and not thrust of the machine (as there are none). The suggested test is to place an on and off device on opposite sides on a scale, and to see if the scale tips (see Figure 11 below). Note that there can be error here as fluctuations and oscillations exist. A more realistic approach is to analyze all external forces acting on the antigravity device and then to search for anything that crosses the surface of the test subject that carries momentum. Other false proposals include reaction/momentum wheels. Any device, despite the claims, cannot change the position of the center of mass in a system. Some have tried to use frame dragging effects, but with no real success. It is important to note that this chapter was designed to show nonviable devices and not viable ones. 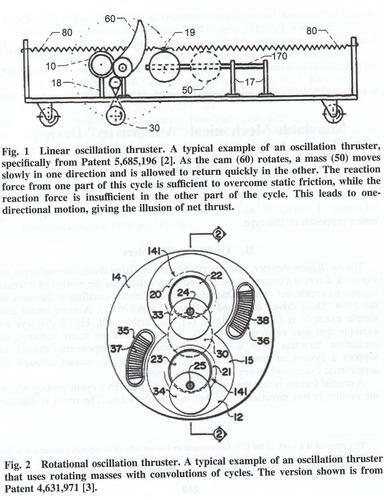 Although patents were issued for the Linear oscillation thruster (see Figure 1 below, Patent 5,685,192) and Laithwaite propulsion system (see Figure 7, Patent 5,860,317), this does not mean that they do what they claim to do. Oscillation thrusters are misinterpretations of differential friction. Gyroscopic devices misinterpret torques as linear thrust. In my opinion the only way to achieve antigravity is to use exotic matter and to actually observe gravitons to get a better understanding of gravity. Note: There is no copyright on this chapter because it is a work of the U.S. Government.